Hi paranormal fans! Today is the last day of the foster an author event. I know, it's sad. But today we have an interview with Joleene and she brought along Jorrick and Katelina from the book to answer some questions that this blogger was dying to know! We both had fun with this and i hope you have fun reading it! When you're done please hop over to her website and check out her series. 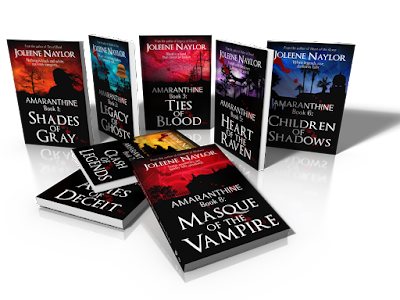 PT to Joleene: Which vampire world was your inspiration for the Amaranthine series? Jorick: Yes, you can probably thank those books for the gleaming spinal column on the opening pages. Jo: As I was saying, I was reading Anita Blake, but I have to give credit to Interview with the Vampire for some of my vampire basics. I saw the movie in ’94 and it was the first time I encountered more “realistic” vampires. By that I mean they were attractive, they had quirks and flaws, they didn’t turn every victim they bit, and they were nothing like the shambling, cheesy almost-zombies of many 80s horror movies. PT to Joleene: What can we expect in the future? More of this series? A different series? PT to Jorick: When you agreed to keep an eye on Katelina, you obviously developed feelings for her. What was the exact moment you realized you were in love with her? Katelina: Come on! I want to hear the answer to this! Jorick: Well it was… I mean, I suspected…I was talking to Oren and it just sort of slipped out. I was as surprised as he was. Katelina: Seriously? That’s the best you can do. PT to Katelina: What was your first impression of Jorick? Katelina: That he was attractive; really, really attractive, and dangerous. The weird thing is that there was something comforting and safe about him at the same time. It’s hard to explain. PT to Katelina: How did you handle the stress of being kept in Oren's home full of vampires? Katelina: Thank you! At last! Someone who understands that! It was a cross between terrifying and mind numbingly boring, like it went from shear horror to nothing in 3.0. I’m not sure that I’ve recovered from it yet, but I admit finding that book in the armoire helped a lot. To get lost in a fictional world for even a little while helped me forget my own horrible reality. Jorick: I rather thought that having me there might have helped. PT to Jorick: Can you tell us why you hate your "sister" so much? PT to Katelina: The vampires kept calling you unimpressive and average. How did that make you feel? Katelina: At first it hurt my feelings. Who wants to hear that they’re not a special princess, even if you *know* you’re not, but later it just made me mad. Like who in the hell did this b**** think she was? Okay, so I don’t look like one of the vampire vixen collection, but so what? They only look that way because they’re immortal. When they were human I bet they weren’t much to look at either. Were they. Jorick? Jorick: What? Hmmm? I really don’t remember. PT to Jorick: Can you tell us how you met Oren? 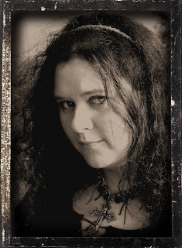 Jorick: Oren was my neighbor… I was tired of living close to The Guild and Malick, so I relocated to Virginia and happened to choose a plantation near Oren and his family. Neighbors in those days were more reliant on one another than they are now, and though I tried to avoid them, the family invited me to things, and invited themselves to my house. They had a good deal of misfortune, especially with children. Oren’s wife lost several in pregnancy, and those that were born were unhealthy, so even when I tried to escape there was a funeral, or some neighborly thing I was forced to do. I suppose I could have scared them away, and maybe I should have, but at the time a small part of me enjoyed it. It was such a contrast to what I’d grown used to working for Malick. PT to Katelina: Before all this vampire business, how did you unwind after a stressful day? And now how to do unwind after a stressful day? Katelina: I liked to go home, change into some jammies and watch TV. Jorick: Or go to the bar with your friend. Jorick: *teases with a wink* Now she likes to aggravate me. Katelina: *flushes* I don’t aggravate you! PT to Joleene: If you could live in any fictional world, which would you choose? Jorick: Not one of her creation. They’re all horrible. Jo: Yes! They’re beautiful and immortal AND they can go in sunlight and get to eat tasty feasts. I’m telling you, they’re like vampire 2.0. You should really look into it. Jorick: *catches Katelina’s hand* No, no she shouldn’t. She’s good where she is. Jo: You’re right. At least for one more book! That was so fun! I hope you enjoyed our posts. Now you can enjoy reading about some truly scary vampires. Take a bite out of Joleene's vampire world!